Julian Assange: Heore or Villain? - Just Tell Me Why | Dichotomies, debates and opinions. Julian Paul Assange is an Australian journalist, publisher, and Internet activist. 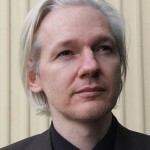 He is best known as the spokesperson and editor in chief for WikiLeaks, a whistleblower website. For some people is a heroe and for some others Julian Assange is a villain. What is he for you? he is a real hero in the field of Internet. He stands up for what no one else will.